Thanks to Robin Green, Antony Brewerton, Helen Curtis, Emma Cragg, Fiona Colligan, Becky Woolley and everyone else who gave their time to chat with me and made me feel welcome. On arrival at the Library, the signage is clear and welcoming. 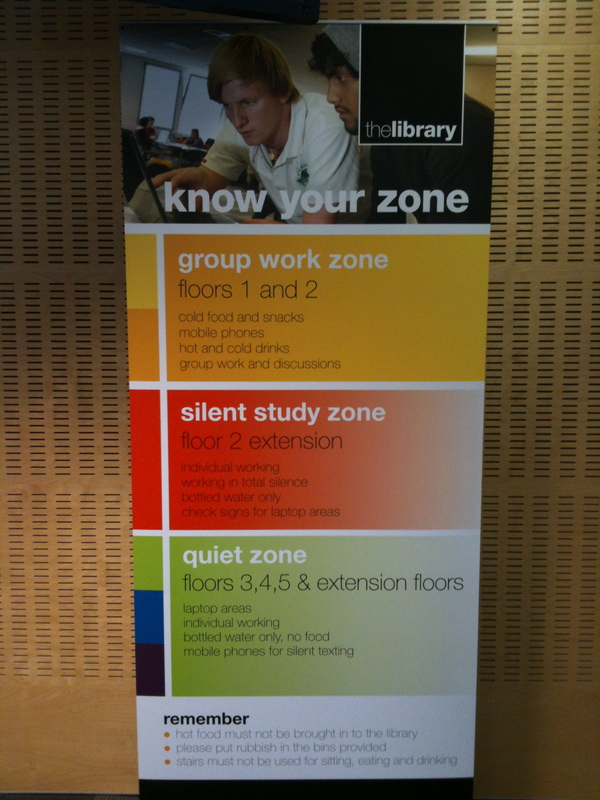 It tells me where I am, where everything is and what the basic library rules are. There are plasma screens at several points in the Library, and they tell me what’s happening today. I like this notice because it tells me where else I can work, rather than just announcing the disruption. 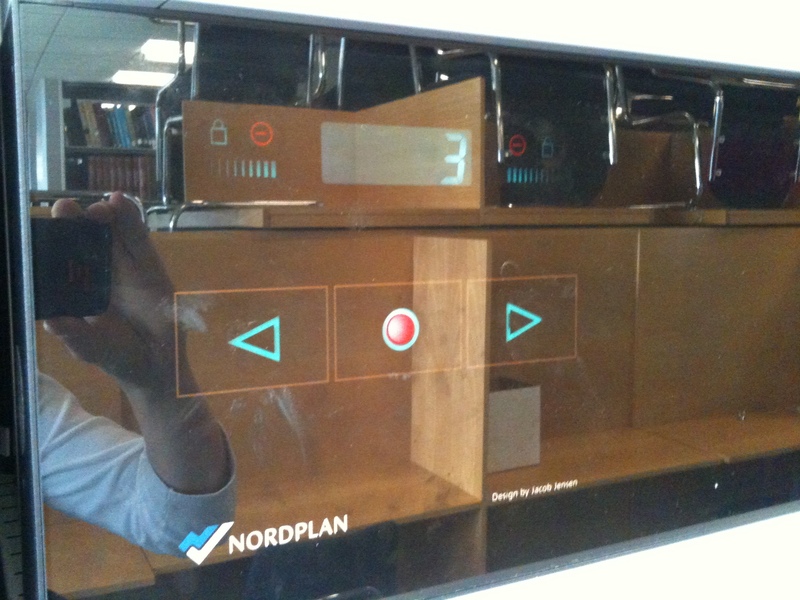 When an item is returned, the machine reads the item’s RFID tag, obtains its shelfmark from the LMS and then directs the item into a book bin according to its destination (e.g. third floor, short loan collection, DVD). 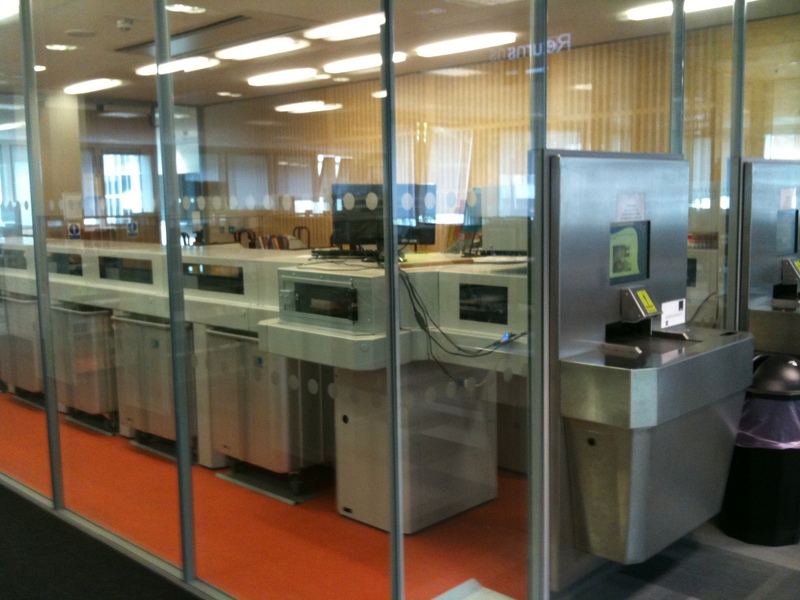 The library has electronic rolling stack, which I had never seen before! 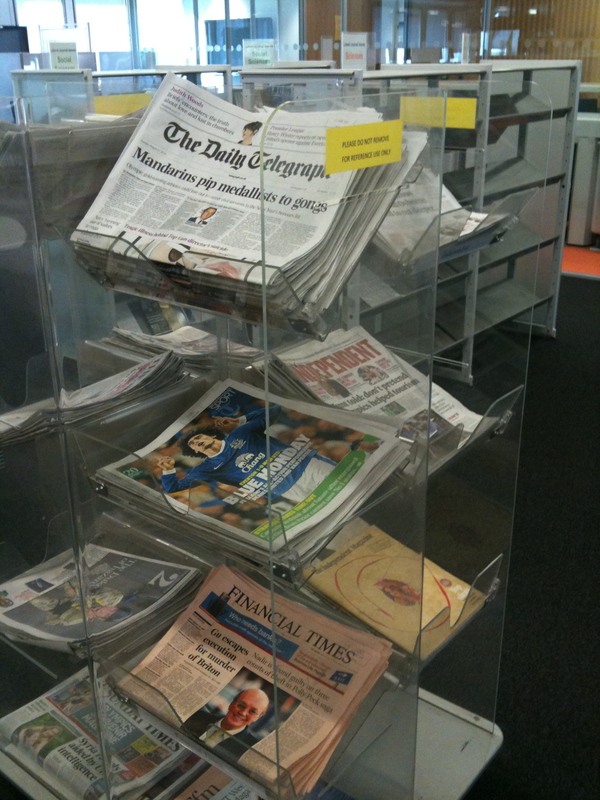 There was an informal seating area with a variety of newspapers for students to browse. Seeing bookmoves and reclassification projects in progress was a comforting reminder that many other academic libraries spend their summers doing this, not just at my workplace! I liked the use of spare wall space (especially in stairwells) to display art – it made the building feel thoughtful as well as functional, and reminded me of the pursuit of education as a holistic, lifelong activity as well as for a focused, specific purpose such as a degree course. The Research Exchange is a physical space and a community of people which aims to bring academics together across a range of disciplines. This supports the University’s mission to increase interdisciplinary research. During this visit, we discussed the conflict between this aim and academics’ need to publish in more subject-specific journals (with higher impact factors) for the REF. The Research Exchange incubates a number of special interest groups including Digital Change, Gender, and Social Justice and Global Development. The venue itself may be booked for events ranging in size from small groups to larger conferences, and there are also computers and informal group work areas for meetings. Research Match is a service which helps Warwick academics to find researchers with similar research interests, and start new interdisciplinary collaborations. 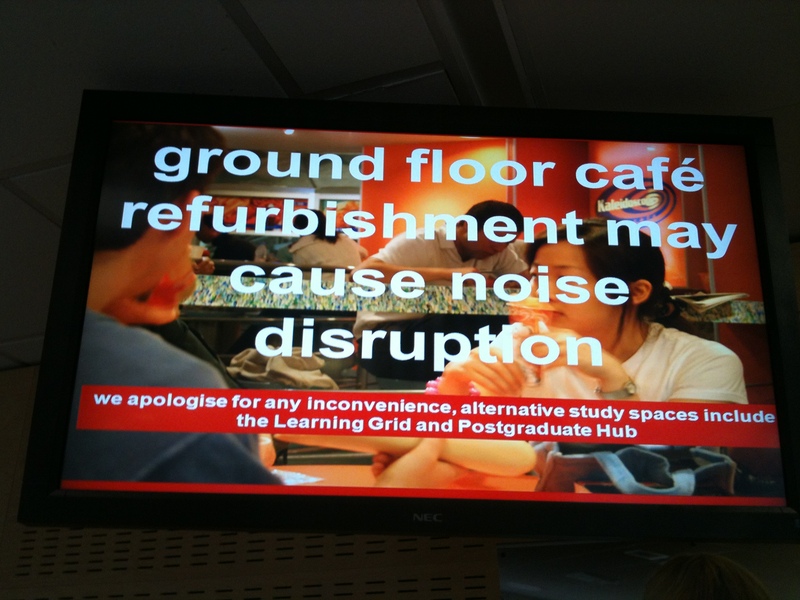 The PG Hub opened in May 2012 and occupies the niche between the Learning Grid for undergraduates and the Research Exchange. It consists of a large central room with comfortable seating which can be re-arranged, with smaller rooms around its perimeter. There are lockers, a computer area, and printers. The glass-walled staff office is right at the entrance to the Hub. 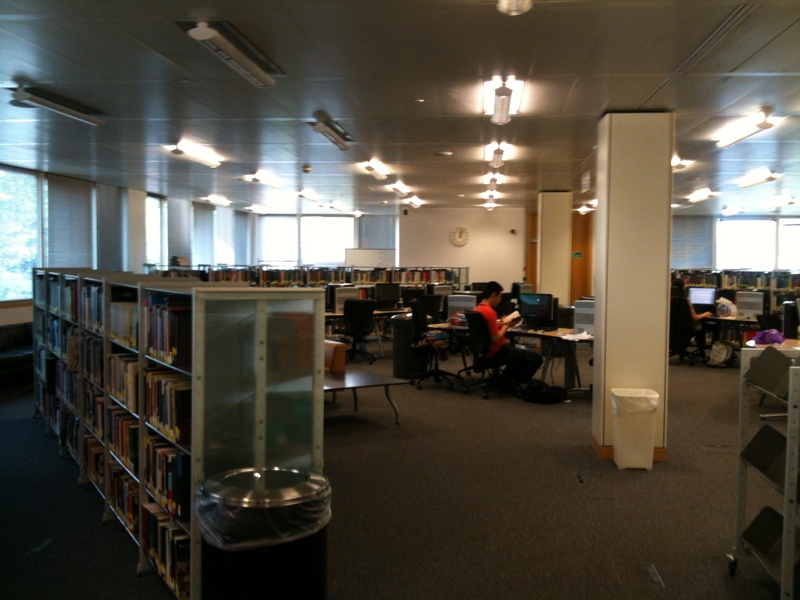 The smaller rooms may be booked for individual or group study, or for informal get-togethers. It was an exciting time to visit, as the staff are preparing to welcome the new intake of students in September. 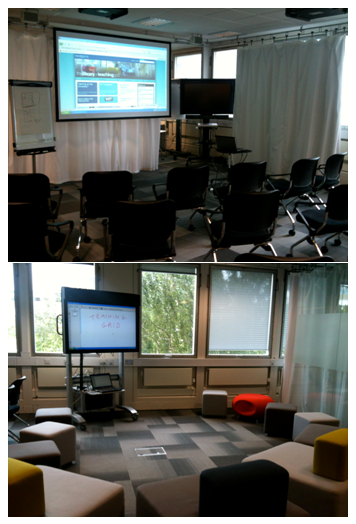 We had an interesting discussion about communicating information to students about how they could use the space. They already have a touchscreen terminal which will have brief guides on the use of the lockers etc, and students will be able use it to make room bookings. Our broad conclusions were that our systems and spaces should be designed to be as intuitive as possible from the beginning, and any guidance or instructions should be designed in to the space (rather than tacking up lots of posters and notices). At both at the PG Hub and at St Hugh’s College Library, roaming staff are used as a way of greeting and welcoming students at the beginning of the academic year, hoping that positive early interactions will encourage them to come back at a later date when they need help. 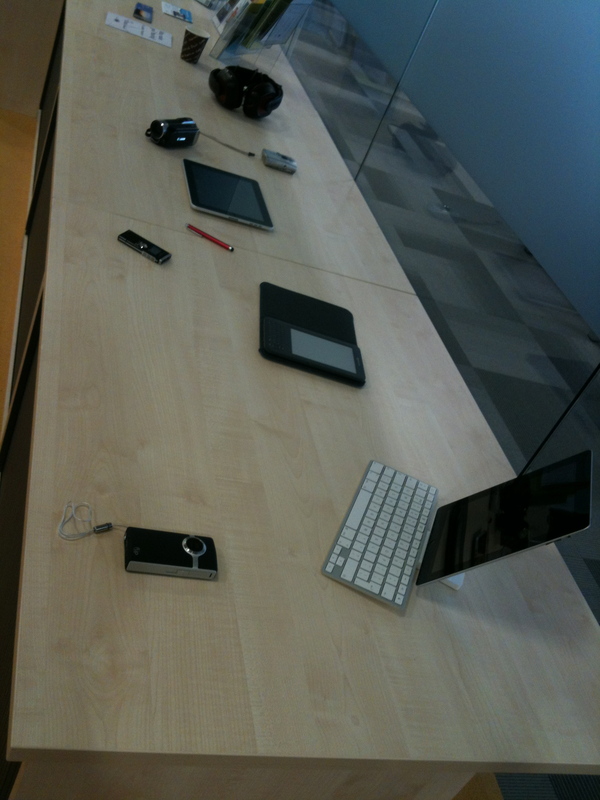 The Learning Grid was established in 2004 as a social and technologically-rich space for students to work. 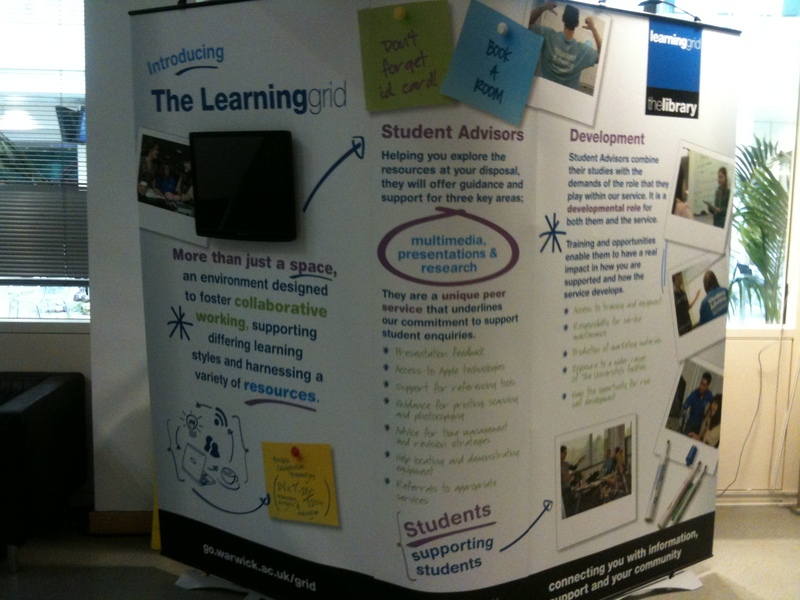 The Learning Grid has two floors and its open spaces can be segmented using movable room dividers. 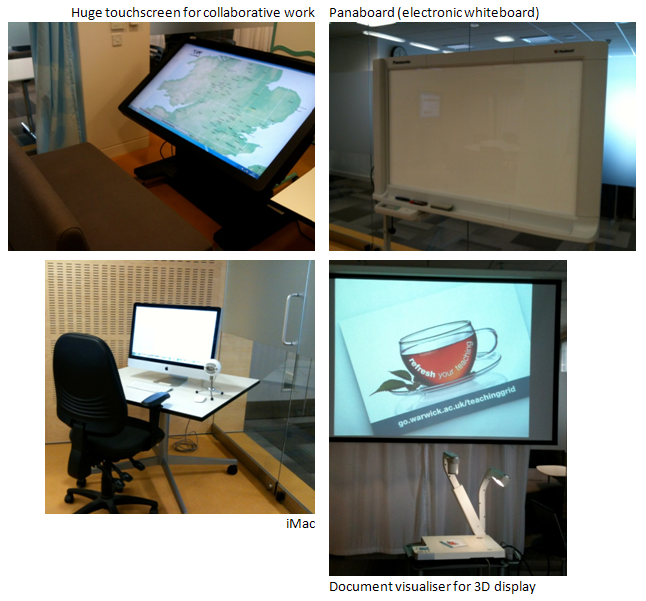 There are computers, whiteboards, smartboards and Panaboards as well as a reference-only collection of core texts. The LG is staffed by a team of part-time student advisers – often PhD students. They answer all sorts of questions from students, and many of them find that knowing about presentation skills and technology helps their work too. I like this concept of having the Learning Grid staffed by students – hopefully they will feel comfortable asking for help from a peer, and there is also plenty of professional help available at the library (and librarians were students once, too!). 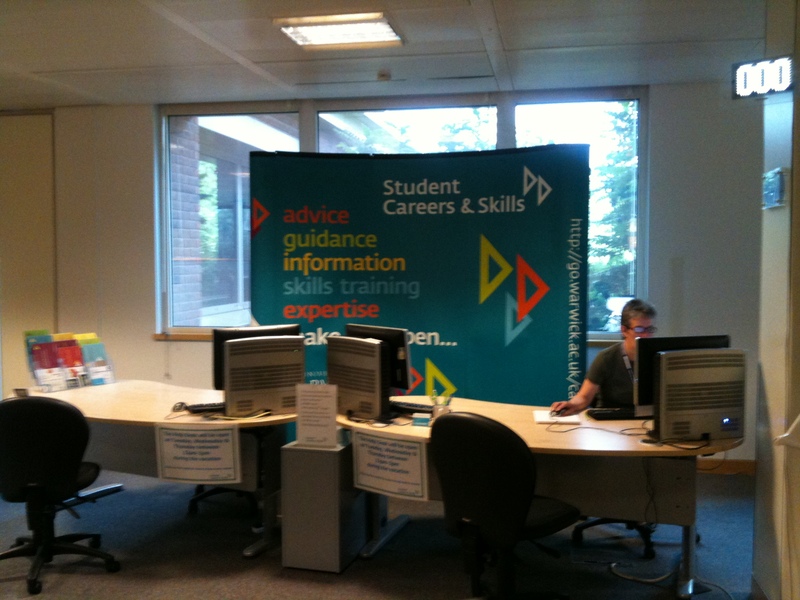 The Student Careers & Skills desk is located in a corner of the Learning Grid – a great way to combine other career skills into a ‘job preparation and seeking’ service, and having it in this central location helps to make it part of every student’s world from their earliest days at the university.